It is always a strange feeling when the World Cup is over. It is such a special time for football fans that the days after the winning country has lifted the cup feel almost like waking up from a beautiful dream. 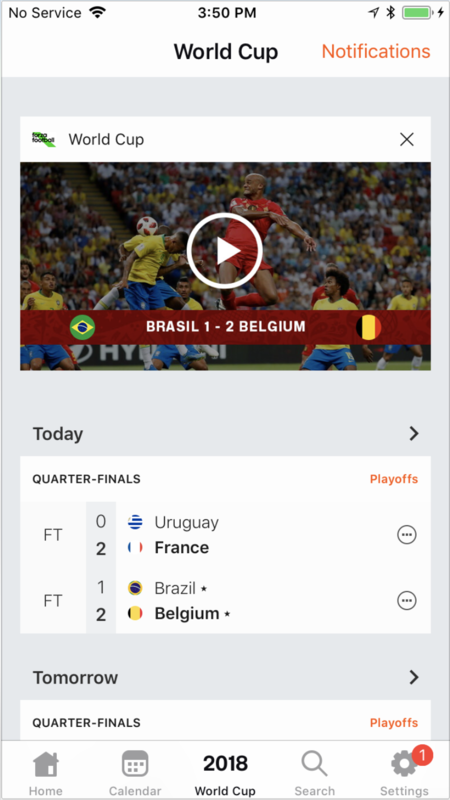 Here at Forza, we recognized how enjoyable and important the World Cup is to our users, so we wanted to make something special and add something new to the app for you to enjoy. That is why many of you will have recently noticed a new tab in the app; the World Cup tab. We hoped that having a special place in the app, where you could see the upcoming matches, the best videos and the Golden Boot standings, would be both useful and exciting. We also added a start-up guide for new users, so they could choose which World Cup teams they wanted to follow. As the World Cup was right at the centre of the footballing world, we wanted to ensure it was also at the centre of the app. We wanted to make the tab in collaboration with you - our users - which is why we spoke to a number of you while we were building the World Cup tab, so we could hear your ideas and work to build something you had specified, rather than something we thought you might want! We are now in the process of creating something to replace the World Cup tab and we want to make sure we do the same. It is very important to us that our users’ opinions, ideas and thoughts form part of the process of building a new feature. That is why we are taking this opportunity to write a blog about our latest idea which we have called “Discover”. We hope that the Discover tab will pick off where the World Cup tab left off, in providing useful, interesting and important information about your favourite players, teams and competitions. Discover will be made up of different themed ‘lists’, to include competitions, players and teams. For example, there might be a list that contains information about the Premier League, another one about N’golo Kante and another about Valencia. Each of these lists will then have cards within them with each card containing a different ‘type’ of information related to the theme of the list. The Premier League version might have a snapshot of the table, exciting upcoming fixtures, videos of recent goals as well as trending news. A player list may well contain videos related to that player, their upcoming and previous games as well as interesting stats that are worth highlighting and latest news related to that player. In terms of a team list that is likely to contain past and upcoming fixtures as well as related news and videos. We feel that the possibilities are endless and that by creating a variety of lists and cards we can offer lots of new and exciting ways to keep up with what is happening in the fast-moving world of football. We hope in the future to allow you to vote on each list with the most popular lists being displayed most prominently. This will also allow for a really exciting feature where you can create your own custom lists to be voted on by our passionate and vibrant community. At the moment, we are at a stage where we are beginning to build this feature so we are starting to think how exactly it will look, which lists and cards we will have as well as how the tab will work from a technical perspective. As always we really want to hear from you, our users, as we know you have so many wonderful ideas and will have some great thoughts and opinions about any new tab that we add. Canny: A new way to give us feedback.